28th of August marks the celebration of Emirati Women Day. 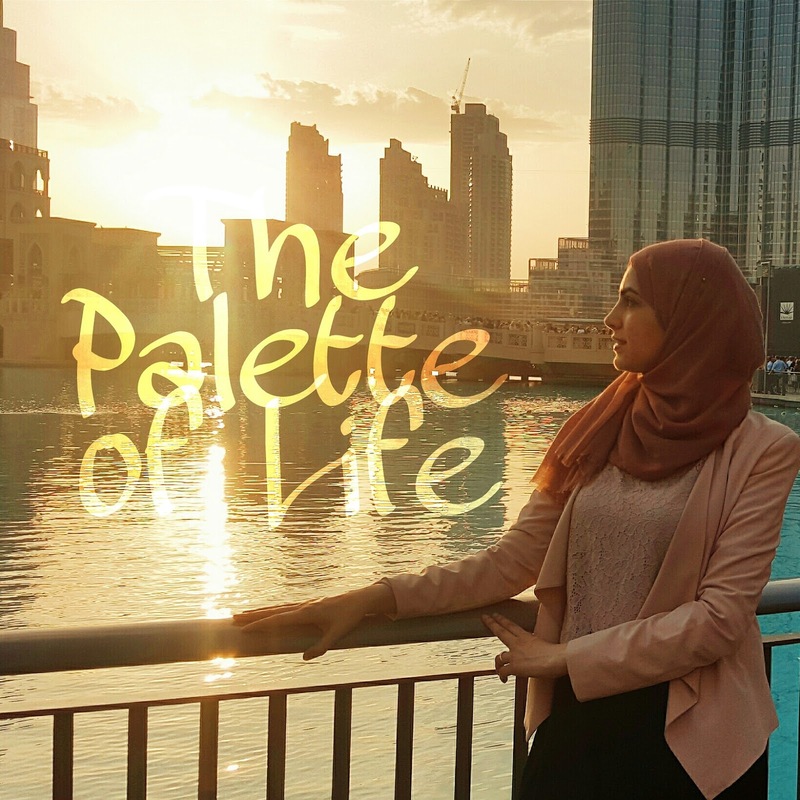 Today I would like to encourage all women living in the UAE to keep up the good work. We women can truly make it all. This type of encouragement is needed because we live in a world where we always have to work double to show our value. But encouragementstill like this make us realize there is someone who recognizes us and give us all what we deserve. Thank you UAE. "Fast and you will be healthy"
Although the first days of fasting in Ramadan can be hard there is a lot of benefit in it. We all know the spiritual benefits: you will feel more for the needed, teach yourself self control and purify your heart. 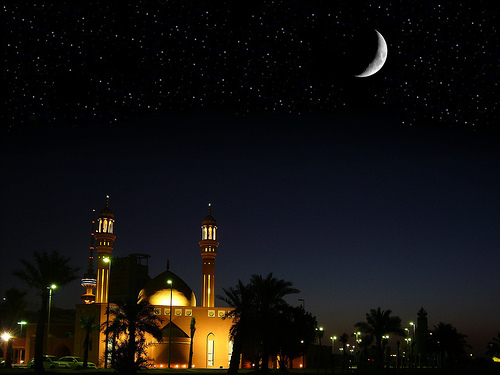 But there are great health benefits that are scientifically proved about fasting the month of Ramadan. A lot of non Muslims in UAE also fast. It's easy when you are surrounded by such kind environment. But if you do some research a lot of athletes also fast. So if you are non Muslim you can also try some days and get this benefits. By improving the blood fat levels. Studies say that fasting lowers the bad cholesterol levels and increases the good cholesterol. By lowering the bad cholesterol you are improving cardiovascular health, which keeps away heart disease. 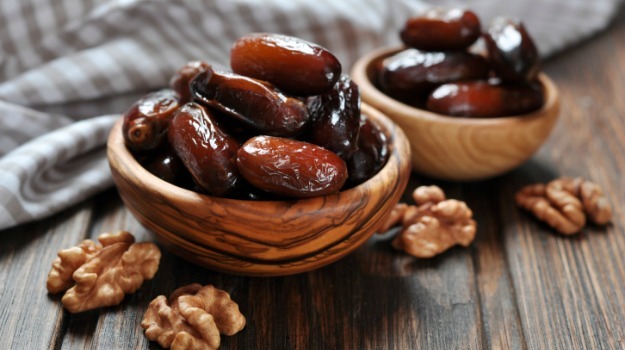 During Ramadan opt by breaking fast with dates. People usually tend to eat more home cooked meals and soups. I usually break my fast with dates, then always eat soup, a main course and salad. By eating this I never eat too much of the main course rather I get fuller with a little bit of each. Also try to drink water or fresh fruit juices. Here, Vimto is very famous but it’s full in sugars try to avoid. Also sodas, like coke and 7up. Even the ones without calories. Its better to drink a fresh juice with 200 Kcal than a Coke with 0 kcal. Fasting may be a very helpful tool to overcome any addictions that you have or to reduce any guilty pleasure like sweets or chocolates. In this month you teach yourself how to restraint from eating and bad habits. If you smoke you cant so instead of smoking in the night reduce it in this month and the last 10 days eliminate. Hopefully you can keep this after Ramadan. I like chocolates and sweets a lot. And when I feel bored at home I always like to have my tea and some biscuits, cookies, anything sweet. In Ramadan I cant so I just eat 1 small portion of sweet after the iftar. Some days I get so busy that I don’t remember to eat. It’s a way of starting a clean eating. Substitute the deserts by fruits. Start a detox this month. In Ramadan people sit together to eat their meals and communicate more. Engage in social Iftars to improve your mental health. 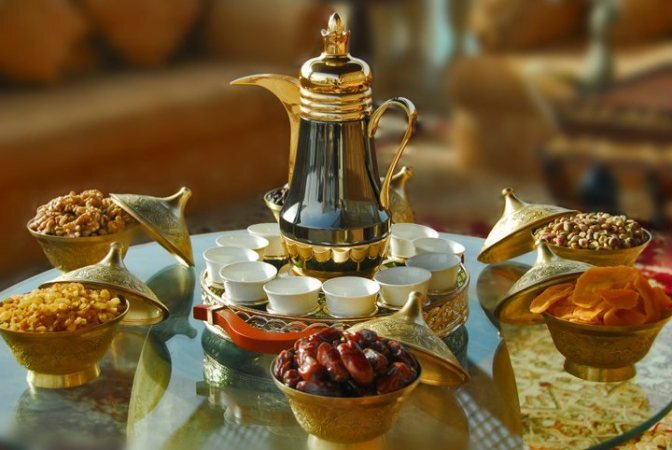 Organize Iftars at your home that way you will be busy cooking and organizing and you will get a lot of reward for it. If you become to close to the sweet table this may not be for you. But if you keep a healthy eating in Ramadan you may shred a few pounds. your apetite will reduce and the stomach will gradually shrink you will need less food to feel full. I changed my profile picture on Instagram. Before I had a logo that I made very rustic with the name of the blog. But last week I went to Dubai and I took this picture that I love with a beautiful sunset that I decided to use. I think it gives the blog a little bit more of personality. I wanted my readers to know who is behind the blog and to feel connected with me. And in the theme of Instagram and social media. I just wanted to write something that has been on my mind on modest fashion and beauty in the social media. I am all about fashion, since young I loved to go to shoppings to see what's on trend. I never had much money to shop so I just window shopping. I'm happy wih my life and the way that I growed up made me a person that can make the most out of small. So I always try to find bargains and the best discounts and be fashionable at the same time. When I moved to UAE and started working in Etihad I had to wear make up everyday. So that's when I start taking more attention to make up and all things beauty. So my opinion is based in my faith and also on what I like. 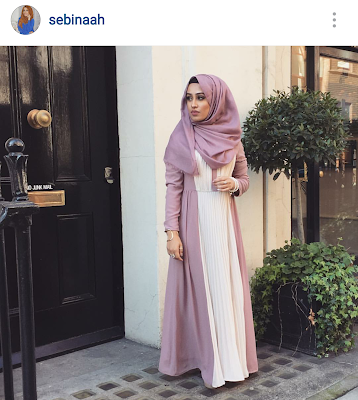 I see all over Instagram bloggers that are convered to wear clothes that are not modest or that are showing half or their hair. The subject is really sensitive and I always read some comments and people enter in big wars. I think that once you start a blog and get followers you have a social responsability about what you send out out there. And more than following trends the big personalities are shown by those who can keep their morals, values and faith. 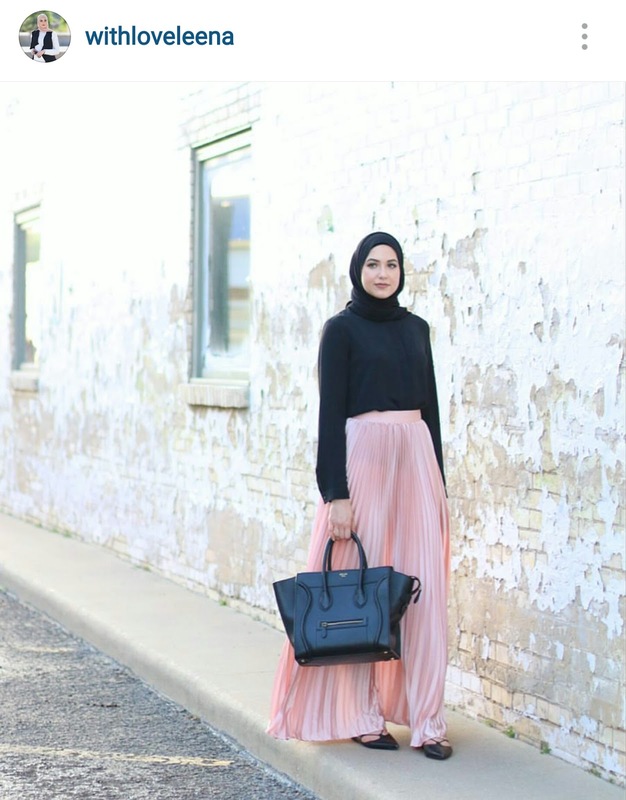 I follow big modest fashion bloggers that didn't had to go further from their obligations to get followers. (Scroll down to see some I love). 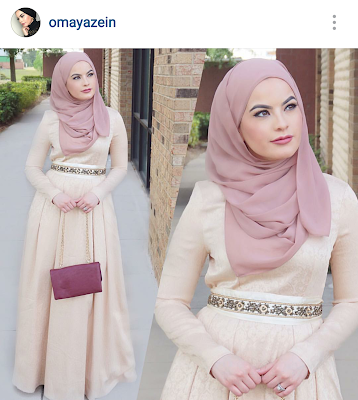 And with this i dont mean you have to wear all black(aka Abaya) to be modest. 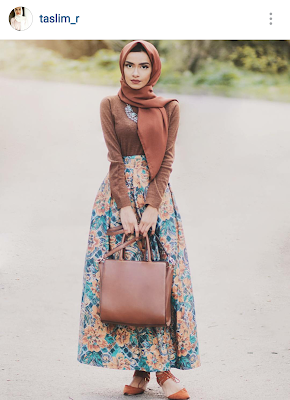 Everyone has their own culture and the meaning of hijab and be modest is to cover. This goes for woman and for men. As I reader I like this: To see someone who is truth to their self's. I like to follow and get inspiratiin by someone who didn't care about what society told them to do. We often read about how hijab is enslaving the woman, hijab is a prison. But I think the biggest oppression is when the woman is not free to wear more. We are always in a pressure to wear less. Doesn't the big oppression come when countries like France that is against the full swuimsuit. There is a brand, Marks and Spencer, launching a full swuimsuit ( often called Burkini) for muslim woman to enjoy going to the beach or pool like everyone else. And everyone is against this. The people against are not allowing muslim women to go to the beach. So who is opppressing? I wish there were more brands like Marks Spencer that come forward and think about their whole public. Let's all be truth to our beliefs. And get followers and be an inspiration for what we are, not what they want us to be. 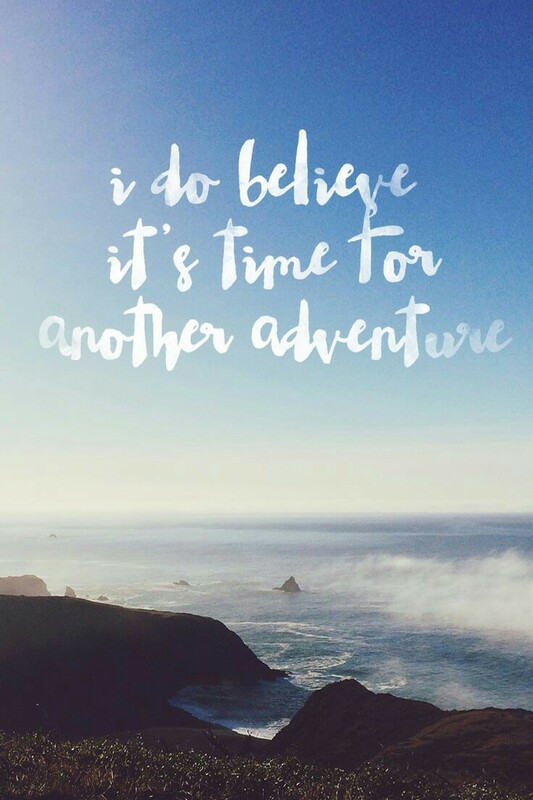 Back at it againg with the blog! So I've been missing from my blog but I decided to come back!! New exciting things coming since summer is here (in Dubai at least)! With summer will come the trips to the beach, Ramadan, Eid and Summer Hollidays. Can't wait to share everything with you guys! This week I had a lunch at a friends house. Since they are from Arab countries I decided to take something Portuguese to show the delicious Portuguese gastronomy. Some things that I miss from my country are the delicious desserts, this two in particular remind me of special occasions. The Arroz Doce (Portuguese sweet Rice) is a very old recipe and no one does this better than our grand mothers. 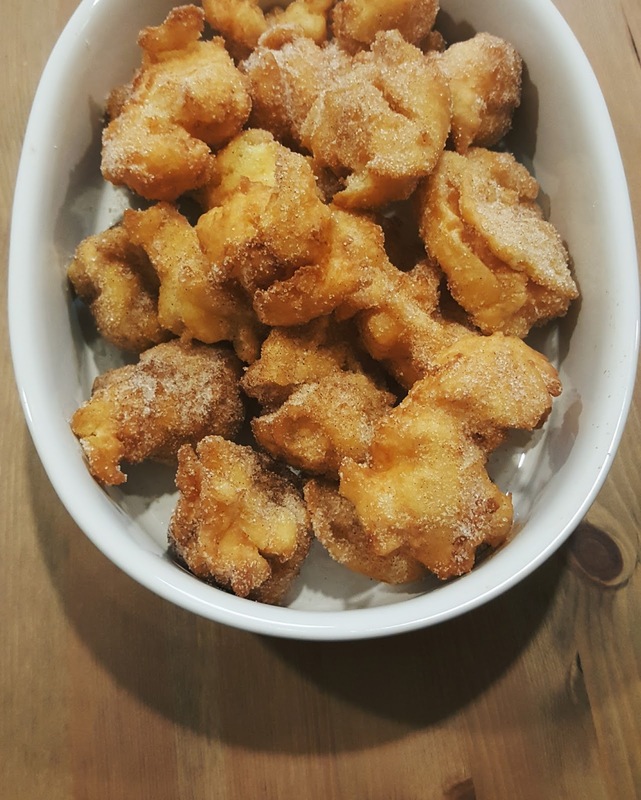 I have some memories of going to my grandmother house and smell the cinnamon coming from the kitchen while she was making this amazing dessert. The next thing I made was Sonhos (dreams). This sweet is usually made during winter holidays and I have no idea why only. Usually in Portugal we wait the whole year to have this. I actually never made it before so I think it was a success they were so delicious. Everyone loved it. And now that I lost my fear of doing them I don't need to wait for holiday season I'll just make them all the time!!! 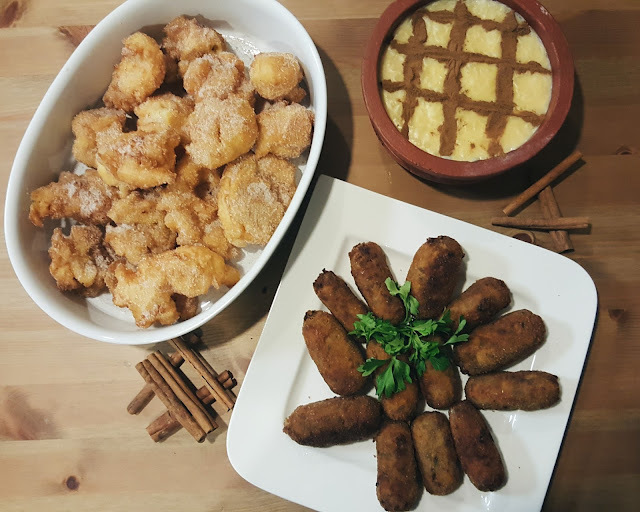 Finally, I made Croquetes (meat pastries). This are everywhere in Portugal. Usually they are a big hit in parties. I love them so much. Also really easy to make. 1. In a pan, add water, milk, orange peel, salt and butter. Let it boil. When starts boiling add the flour and mix very well until it forms a dough. 2. Remove the dough from the pan and let it cool for a while. Remove the orange peel. 3. Add the eggs one by one and stirr well until smooth. 4. With the help of 2 spoons make small balls be carefully because they will triple the volume. Fry in hot oil in low heat and chop with a toothpick. 4. After frying, remove to a plate with paper towels. 5. Mix the sugar with cinnamon and coat the dreams. 1. In a pan boil add the water and rice. Season with salt and boil until there is no more water. 2. Add the butter, the lemon peel, cinnamon sticks and milk. Mix and let it cool for 30 minutes. Add the sugar. 3. Mix the eggs yolks with the cup of milk. And add to the rice. When it starts to boil remove from heat. 4. Serve it decorated with cinnamon. 1. in a pan add the butter, crushed garlic, bay leaf and meat. Season with salt and pepper and cook. Stir well until all the meat falls apart. remove the bay leaf . 2. Add the bechamel sauce to the meat and mix well. Check the seasoning. When the mix starts to come off the bottom of the pan remove from heat and set aside to cool. 4. Fry the Croquetes both sides in hot oil. remove and place on a plate with paper towels. Croquetes are also a good lunch served with rice. If you got curious about Portuguese recipes you can find more here, here and here. Are you going to try them? If you do please tag me on Instagram @the_paletteoflife I want to see how your recipes turned out!! I like long romantic walks..
For us girls make up is like part of our lives. I couldn't leave without make up. Although sometimes I like to let my face breathe mostly everyday I wear make up. For the everyday, I usually put foundation+powder, I would go just with foundation or a BB cream but because of the heat in UAE and my t-zone oily face I can't forget the powder. Top it with mascara and eyeliner... and voilá. If I have more time usually on weekends I put more effort in my make up and do some cat eyeliner a smoky eye, false eyelashes and some contouring. After applying make up the beauty corner is a big mess. I think is every woman struggle to find their make up inside all the the make up pouches and boxes. we have our eyeliners in one place the eye shadows in another finding and organizing is a complication. I've seen all the bloggers using this make up organization. And I'm not exception. I got mine in a Facebook page. It's very practical with the drawers and the lipstick organizer. I'm very happy with it. 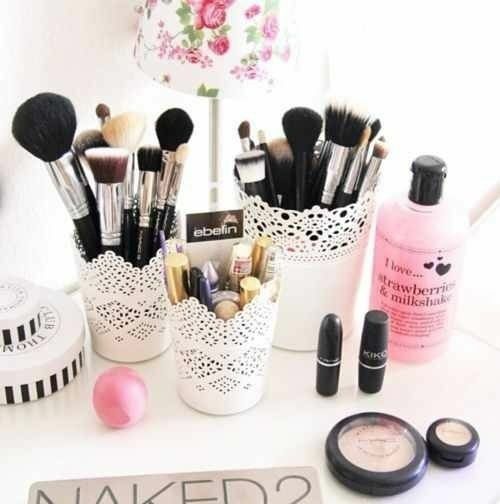 And now all I want is to have more make up to fill those drawers. 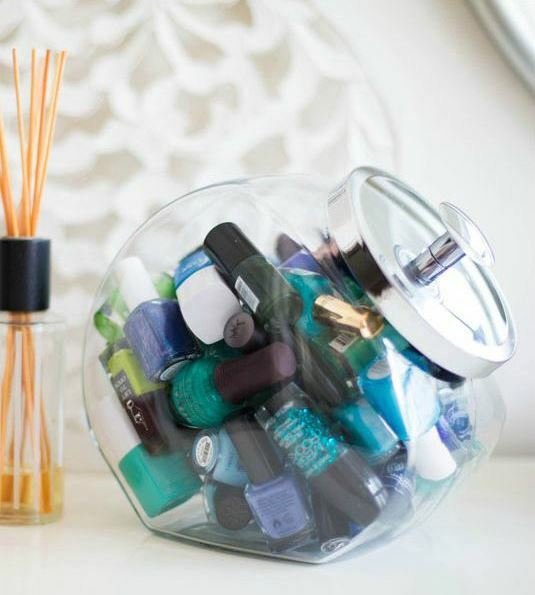 But if you are a DIY girls there is so many nice ideas on Pinterest. Ill show you some that I loved. 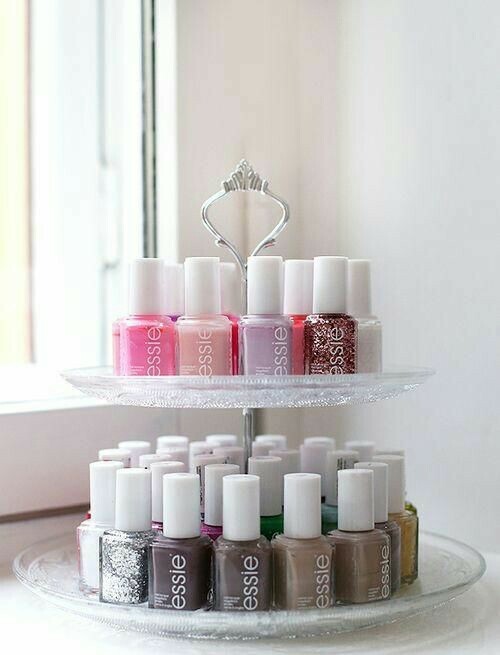 I don't own to many nail polishes because usually I go to salon but this idea with the cake stand is so cute. Or the cookie jar. Beauty is also a good sweet for us!! 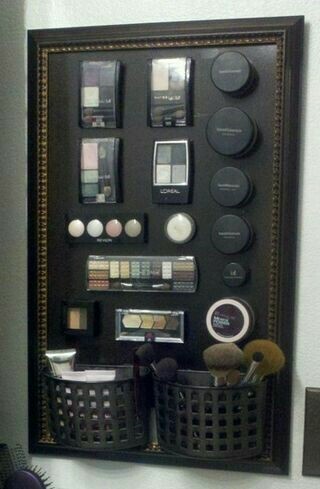 If you are practical or you have to rush to work everyday and want to have your daily make up essentials on hand why not magnetize your products and display them. You will definitely know where they are. For the brushes I still haven't decided where I'll put mines. 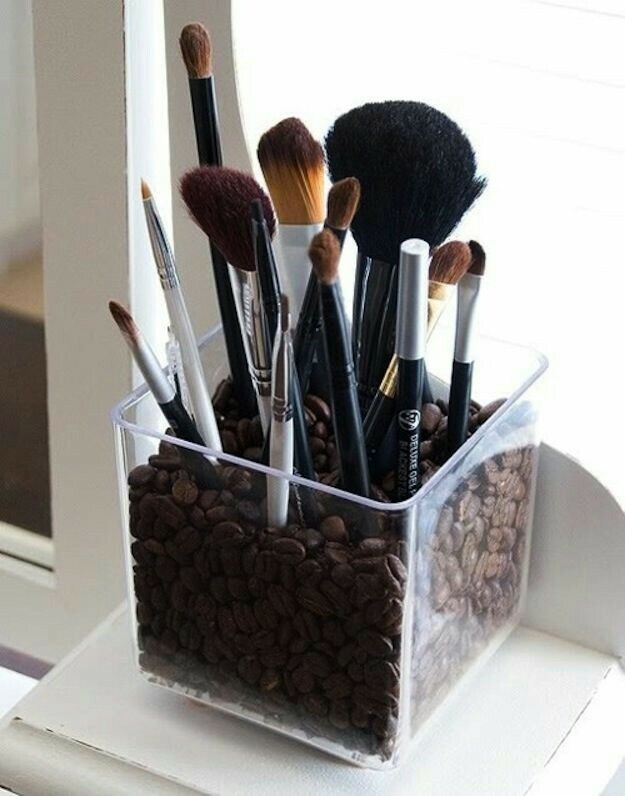 I like the idea with the coffee beans it will hold the brushes and also give an extra nice smell in the house. And coffee beans are also good to absorve bad smells. The Ikea white vases are also a really cute idea. I've seen them everywhere and for the price It's really a good option. 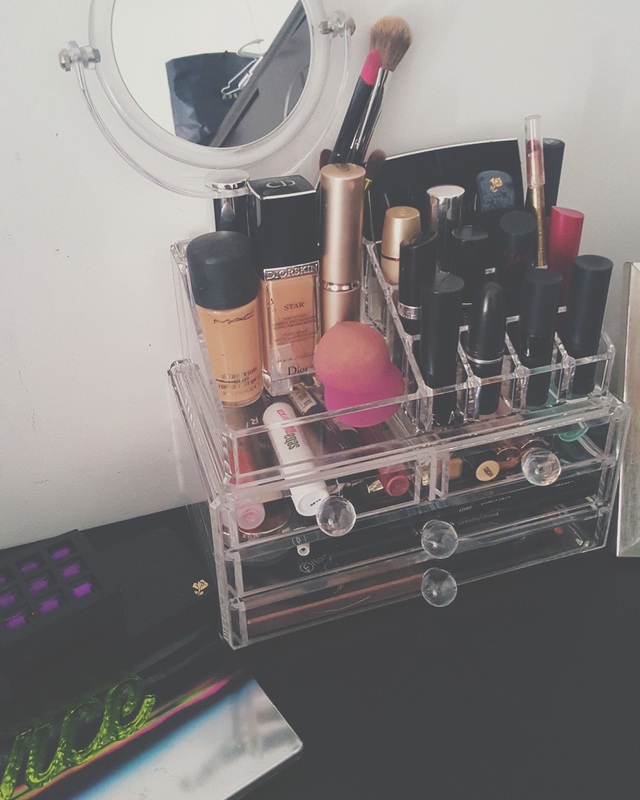 Hope you enjoyed the ideas.Tell me how to you organize your make up. This is a very easy recipe that will let everyone with their jaw dropped. Brigadeiros is the Portuguese word for chocolate fudge balls. Although it's a Brazilian recipe we do it a lot in Portugal. We have a lot of history together!! So here is the easiest most delicious recipe!! Mix all the ingredients in a non stick pan and put on medium heat. Cook for about 40 minutes mixing always until the mixture starts to show the bottom of the pan. When it's ready remove the mixture to a greased plate. Let it cool room temperature. 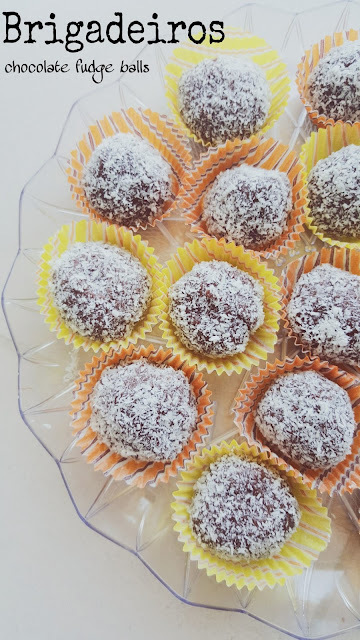 When the mixture cooled roll balls and decorate with the Granulated chocolate of coconut.